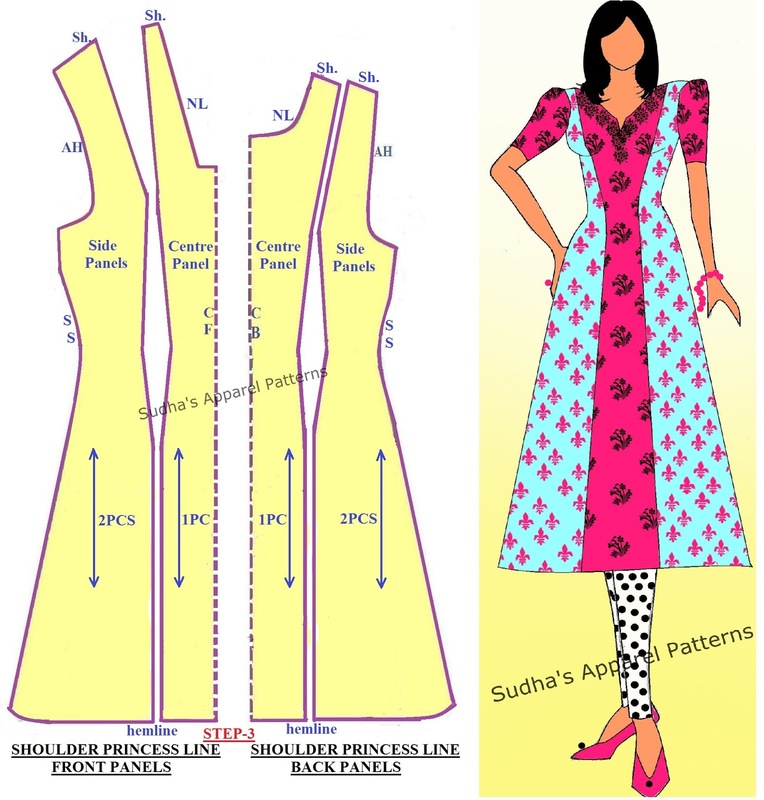 Sudha's Apparel Patterns: How to make Kameez with Shoulder Princess line? How to make Kameez with Shoulder Princess line? A princess line dress is a fitted garment that has seam lines crossing over the bust point, replacing darts. As these princess lines absorb fullness of dart within stitch lines and control the fit of garment, they are also called dart equivalents. In this post, I have shown step-wise pattern making of Kameez with Shoulder Princess line in Front & Back. It is a step-wise method where I have used Basic bodice (of Front & Back) and Basic Skirt Sloper (Front & Back) made using personal body measurements. For making Shoulder Princess line Kameez, trace Front Bodice with shoulder dart & waist dart. Below this bodice, trace Front of basic skirt. Similarly, trace Back Bodice with waist dart & below that bodice, trace Back of basic skirt. (refer below image showing STEP-1). * Length of the Basic Skirt Sloper is from waist to knee. You can extend the length below knee for Kameez as desired after tracing the drafts. - To shape the neckline as per required pattern, go inward from neck-shoulder point by 1.5 cms. - From that point, mark the neck depth point (using a scale) on Centre Front. - Join these two points based on required neck shape. - Deepen the armhole by 1.5 cms from armhole-side seam point in both Front & Back bodice. - Draw a new arm curve running parallel to original arm curve and merge as shown in STEP-2 in below image. 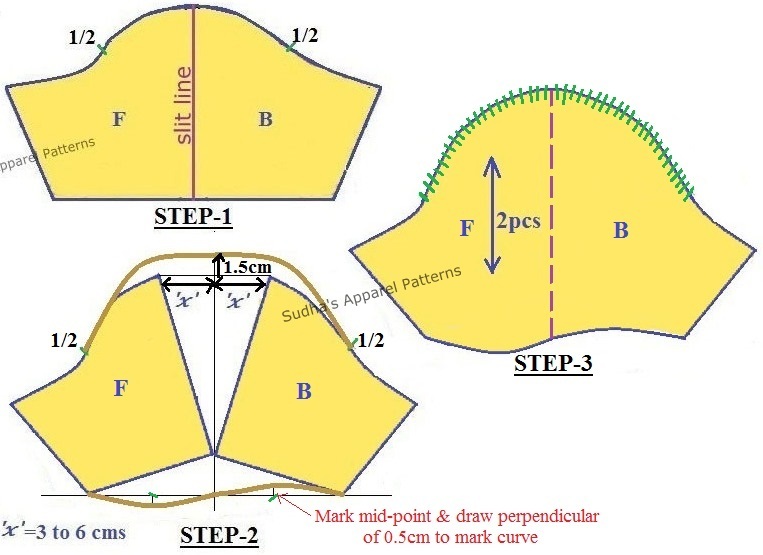 You can merge the new arm curve in the 1/3rd armhole marking (refer image). - For flare, move outwards from hemline by 5 to 15 cms. depending on how much flare is required. - Using a scale, move up towards hip line, join this flare point to hip curve (i.e. merge slant line of flare into hip curve). - At the hem and side seam corner, move up on slant line by 2cms (see STEP-2 in image) and give a slight curve shaping to hem. - * Shape the side seam contours at the waist to hip region with a slight smooth curve. - Mark the shoulder dart and waist dart in purple color lines. - From bottom of the waist dart, draw a straight line moving down towards the hemline. - Mark midpoint of shoulder. Join this midpoint to top of waist dart with purple color lines. Cut along the purple color lines shown in above STEP-2 image to separate the Centre Panels from Side Panels. You have to cut the pattern along the shaped neckline, deepened armhole, added flare, shaped side seams and the marked shoulder princess lines. I have combined a Leg-O-Mutton sleeve pattern with this Shoulder Princess line Kameez. Leg-O-Mutton sleeve have fullness added in the form of gathers only at the sleeve capline (i.e. top curve of basic sleeve). This sleeve is fit at sleeve hemline. Leg-O-Mutton sleeve can be of any length & it's fullness can be more or less as desired. *When making Basic Sleeve pattern always measure the deepened arm curve of Front & Back bodice accurately with a measure tape. *In order to ensure perfect fit of a sleeve, always make the sleeve draft after you have finished making the Front & Back patterns of your garment. How to make Kameez with Shoulder Princess line & Leg-O-Mutton Sleeve? - Use pattern of Basic Sleeve with your desired length for making Leg-O-Mutton sleeve. I have used Sleeve length as 18 cms. - Cut along the marked slit line to separate front & back of sleeve. - Join sleeve cap in centre with fine black line as shown in image. From this line, go up by 1.5 cms to mark new sleeve capline. - To mark new sleeve capline, mark midpoints (i.e. 1/2) of front & back sleeve blocks (refer image). -- Then draw a new curve (follow beige colour curve shown in image) from 1/2 front sleeve cap-passing over 1.5 cms-to 1/2 back sleeve cap. - To shape new sleeve hemline, draw horizontal line joining two end of sleeve hem with fine black line as shown in image. - Mark midpoints of horizontal line & draw perpendicular of 0.5 cm to mark curves (follow beige colour curve shown in image). 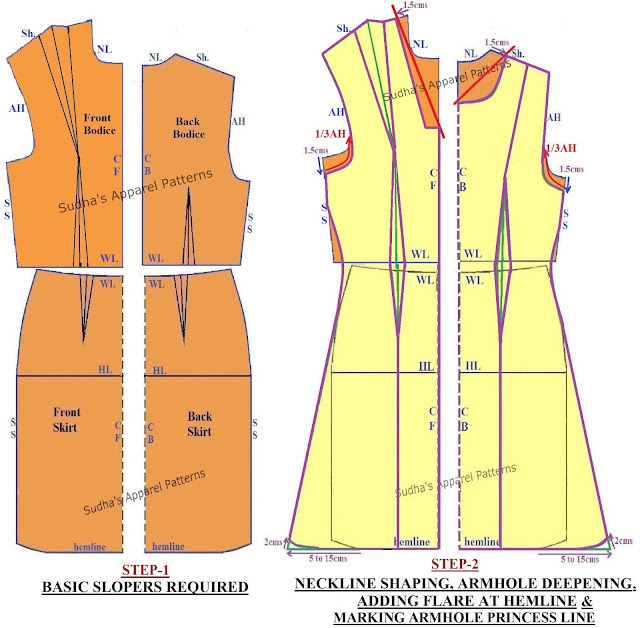 - Trace STEP-2 showing beige colour curve at sleeve capline & hemline and sleeve side seam. - Leg-O-Mutton sleeve pattern is ready with added fullness at it's capline marked in green lines. - Cut along the purple color lines to separate the Centre Panels from Side Panels.